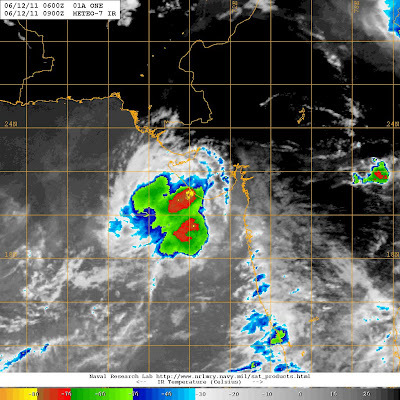 IMD has announced the depression has crossed the Gujarat coast at 8.30 am Sunday near Diu,which is 20.4N and 70.6E. Location of AS-1, as a depression, shown on the graphical map as on 11.30 am IST from JTWC. The latest location as on 2.30 pm IST (Sunday ) is 20.8N and 70.3E. Winds are steady at 30 knts. Exact centre location in such systems are always a matter of conjecture and made on calculations with MSLP measurements. Moving very little to the NW, almost quasi -stationary in the last 3 hrs , the system's maximum life intensity seems to be on peak. Expected to weaken ,as anticipated, within the next 6 hrs. Predicted movememt is NW, and I feel the direction will hold. But, the speed of tracking is slow, and if the current speed is maintained, then the weakening and precipitation effect will be in a restricted region , mostly in coastal and southern Saurashtra. Clouding is now in the NW-West-SW quadrant of the system. 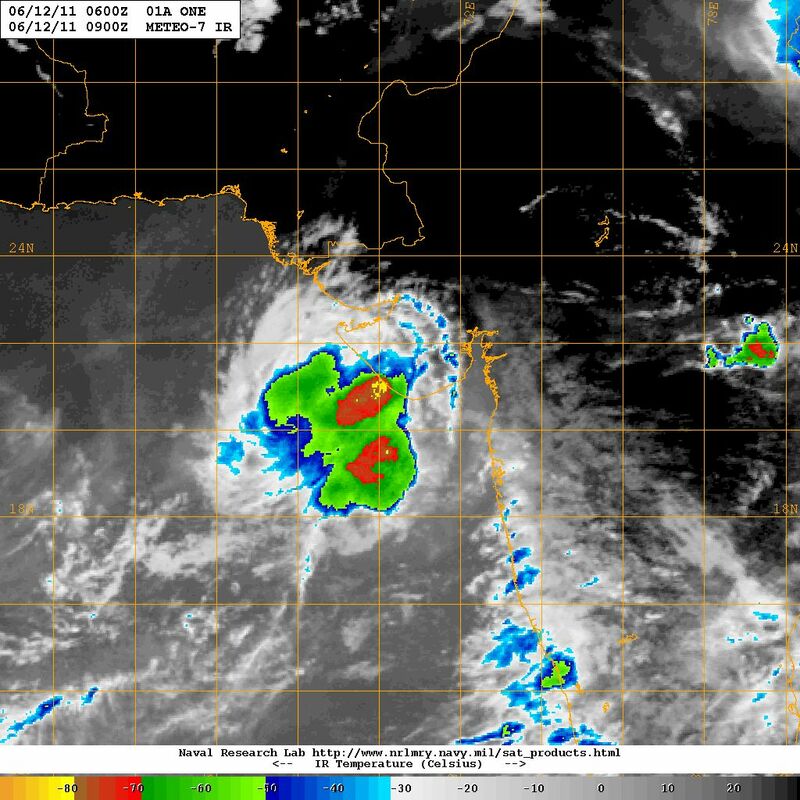 AS-1 clouding should move into the eastern coastal regions of Sindh by Monday. Clouding with limited precipitation could be expected in lower coastal Sindh regions on Monday. WHY IS RAINING TODAY HEAVILY, YOU REPORTS SAID THE RAINS WILL SUBSIDE TODAY ???? Santacruz, anheri - 200mm of rain today. Probably total rain has exceeded june average. When will the rain stop????? WHAT?? ?200MM rain in scz today? ?Are you serious? ?Or are you including yest 180MM with it/??? & also now that the system is almost gone..do we see any more rains in Mumbai in the coming week?? Why the south gujarat region is not benefited from this system? yes, mumbai rain from june1 is almost nearing 500mm, with 3 weeks to go sure to touch 1000mm. Last few years arabian depression over south india - kerala, karnataka travel north and depression over the bay travel west both pounding Maharastra. South india, srilanka quiet no rains at all. Bangalore only 1mm since june. Usually cyclones over arabian sea is less, but last few years we see cyclone during june as well as november over arabian sea. Nature reversal of cycle??? Will khi also get some precipitation tom Rajesh? @sridhar. Subside ?? Did i mention subside ?? Reproducing my forecast:"A few showers of short duration on Saturday night. Sunday: Cloudy, with short sunny intervals. Short duration showers". Rainfall during day between 8.30 am and 5.30 pm on Saturday was 181 mms at S'Cruz and 102 mms at Colaba. Same period figures for Sunday S'Cruz is 26 mms and Colaba 12 mms.Little less i think ? @sset. Cant say reversal of cycle. @ron. rain figures put up in reply to sridhar.Putting up my views later on Mumbai next week..
faced extreme weather in bombay high ,actual pressure 994mb wind speed 70 knots gusting 100 knots.were in the eye of cyclonic storm without any prior warning.never seen anything like that before.